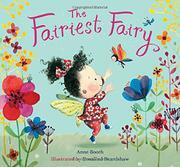 A quirky little fairy discovers her talents and abilities with a little help from her animal friends. Betty is a fairy, but she never does what’s expected of her in Fairy School. Although she follows her teacher’s instructions and mimics her classmates in order to complete the required assignments, she can’t seem to perform as a future fairy should. After each failed task, Betty encounters a rabbit, a little bird, and a butterfly, respectively, that faces a challenge. She kindly helps them to feel better or succeed in their challenges. And then it is time for the rulers of this fairy world to decide who is the fairest fairy of all. Although readers will easily guess who is the titular “fairiest fairy,” they should enjoy this charming story that encourages them to find their inner talents and to make friends. The rhyming text is laid out on the pages between bright images, some verses requiring readers to force their cadence to achieve the rhyme. The mixed-media illustrations depict cute, snub-nosed tots with wings; one of the little fairies is black and the king has medium-dark skin, but the rest, including Betty, appear to be white.